If you are an avid birder, you will know that out of 6 species spoonbills, Black-faced Spoonbill (Platalea mino) is the rarest in the world, not only because they have a very small population of around 2000, currently they are on ICUN red list as globally endangered species. And there is very little research data about this bird. They breed on rocky islands off the west coast of Korea and Liaoning province (遼寧省) in China. They migrate to few southeast Asian countries, such as Hong Kong, Taiwan, Japan and Vietnam for winter. 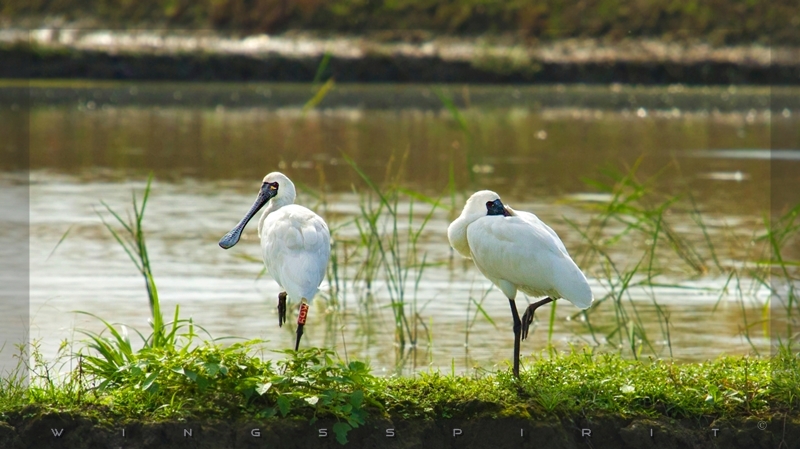 More than 60% of them spend their winter at Tsengwen estuary (曾文溪口), Taiwan. Chasing Black-faced Spoonbill was something I really wanted to accomplish during my visit. I was thinking to go to Tainan, which was about four hours drive from Taipei. Accidentally I ran into some local birders. One local birder informed me he just saw 6 birds in Yilan a weekend ago after his unsuccessful pelagic trip. That was an encouraging news to me because Yilan is just an hour away! Plus, going to Yilan via this newly constructed Hsuehshan Tunnel shortens my travel time to more than half. So I decided to try my luck the next day. I got the GPS location and drove all over the area and did not see any spoonbill. After taking lunch break, my brother told me it was too late to find spoonbills. I told him birds have to eat, especially these spoonbills are crepuscular foragers. We started driving around some abandoned shrimp farms near Wen-di. One time we had to stop our car due to my car-sick, oh, well! My brother started searching some farm lands and found a tiny white spot. It was at least 600 to 800 yards from us. Disappointed, it was a Sacred Ibis when I looked through my binocular. It was getting dark and I told my brother "let's just go home ...birding is just a hit or a miss...." He did not like what I said and replied "Linda, aren't you a dedicate birder? You should not this easily give up....". I know they are here and they are waiting for me.... Few times we got lost in these shrimp farms and when we tried to turn our car around, I saw a middle-aged man riding his bike coming towards us. His friendly dog was the first one running towards us. I came out of car and greeted him and hoped to get some information. This man told us he has seen spoonbill few times last week but has not seen them yesterday or today. He told us to turn around and follow him to a small street where he saw these birds last week and plus many other migrants we could see. When he mentioned "migrants", I immediately sensed that this man was not an ordinary local. He must love birds and wildlife! The first thing came to my view was hundreds of Black-winged Stilts, if not thousands, sitting in the middle of a large pile of mudflat! He pointed few streets that we might have a great chance to find spoonbills and he said something to me before leaving with his bike, he said " you look like someone loves wildlife... and please, help us to protect them not to harm these beautiful birds.....". My shoulders feel heavy after hearing what this man just said. One thing I noticed was locals here don't really bother these birds or get bothered with. I have seen over 10 Grey Herons, many egrets and ducks all over a pond and there is no electric fence or hunters to harm them. They are just feeding and very relaxed. Farmers here are kind to others and, especially, very kind to wild birds! No wonder there are over 620 species, including resident and migratory birds, have been documented in Taiwan. We did find spoonbills near dusk after a whole day searching, not 6 as Sam told me, but 9 of them, including a famous banded K69! It was not an ideal light condition to photograph them so I took some videos. My brother was amazed to find out what I told him was right that these birds need to eat, especially before sunset. Knowing bird's life and behavior is very helpful to my birding journey. I was so happy that mum was with us in this trip and now we have so much to talk about from this "spoonbill adventure"! Acknowledgement: Mr. Sam Tsai, an exuberant birder, I met from a birding trip held by Wild Bird Society of Taipie, provided me with the first handed information and the GPS location; a local unnamed gentle man we "accidentally" ran into (but, there is really not accidental ...if you understand what I mean) when our car got stuck in a small winding road, pin-pointed some possible locations. Mum's great sense of humor and her optimism eased my anxiety and brought me a great comfort. Finally, this adventure in searching of spoonbill won't be such a wonderous journey without my brother being a tireless chauffeur and his 20/20 vision helped spotting my first Black-faced Spoonbill! Established in 2009, Taijiang National Park (台江國家公園), within its 4,905-hectares of land area are the Black-faced Spoonbill Reserve and Chiku Wetlands (七股濕地). Many mangroves growing in the Chiku Lagoon and Sicao Wildlife Refuge (四草野生動物保護區) creates the only waterborne green Tunnel in Taiwan. Linda, I love this story and the video! 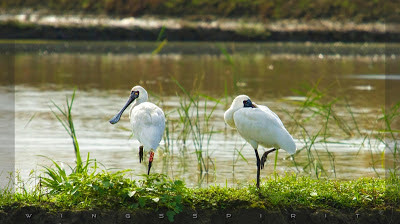 Black-faced Spoonbills were on my target list, too, for my first visit to China three years ago. I also found them around Thanksgiving and late in the day when they were feeding. I saw mine in another major wintering area - Deep Bay between Hong Kong and China. Your video perfectly captures their feeding style of swishing their bills back and forth in the water. I was surprised to see how differently they feed from our Roseate Spoonbills.